These executives, all on this year's list, are clearly capable of leading a major company someday. Born and raised in Greece, Cruz, 52, started in investment banking. She didn't stay long. "I liked the markets - the energy, the noise," she says. "And I like trading because of the unequivocal nature of the report card." A master of risk assessment, she headed fixed income for five years before rising to co-president in 2005. 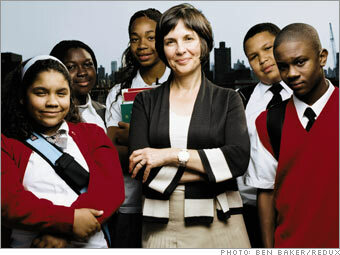 Shown here with kids at the Harlem Children's Zone (where she's on the board), Cruz counsels young people not to plan their careers. "When you don't plan, things are easier," she says. "You focus on doing a great job."